Love sweet potato casserole but feel like the marshmallow topping is so 1980? We’ve got a grown up version that we think you’ll enjoy. These Boozy Smashed Sweet Potatoes have all the creaminess of sweet potato casserole that you love, with a little extra kick of bourbon mixed in for good measure. It’s topped off with crunchy pecans that have been bathed in butter and maple syrup. Did I have you at boozy? These definitely had my attention. One bite and I think they’ll have yours too. Tired of sweet potatoes topped with sticky marshmallows? 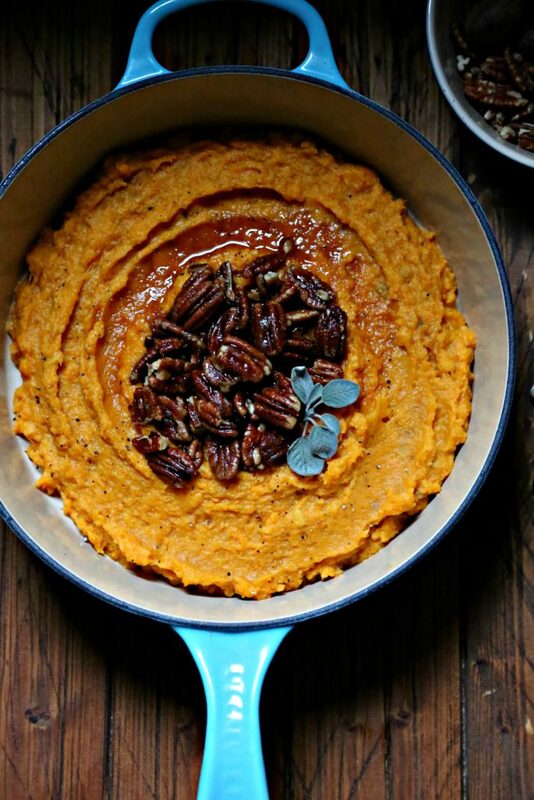 Or just looking for something a little different to do with sweet potatoes for Thanksgiving (and beyond)? 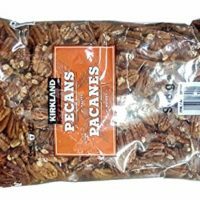 We think spiking them with bourbon and topping them with butter and maple bathed pecans are the way to go. Grab the good bourbon for this one. It’s just mixed in and not cooked out so the good stuff is in order. How do I make smashed sweet potatoes? Start by peeling and cubing the sweet potatoes as evenly as possible. Place sweet potato cubes into COLD water and season with salt. Bring to a boil then reduce to a simmer and cook until fork tender. 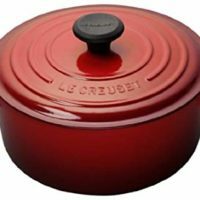 Drain and return to warm pot. What do you top smashed sweet potatoes with? 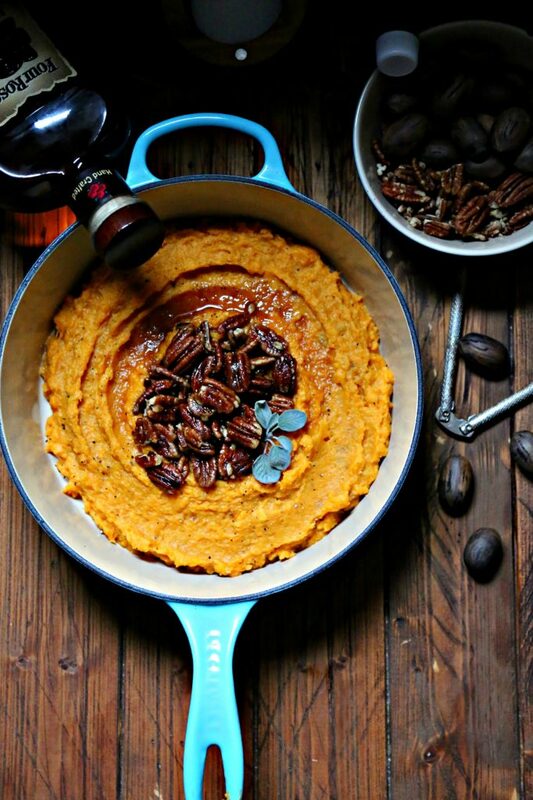 Pecans cooked in melted butter and pure maple syrup are the perfect compliment to smashed sweet potatoes. Season with salt and pepper and top with fresh sage if desired. 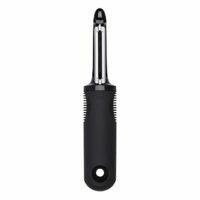 This dish can also be made well ahead of the meal and simply re-heated. If you need to bring a dish, volunteer for this one. It couldn’t be easier and you could even make it the night before. Just add a little extra cream when reheating and mix through. My tip for enjoying Thanksgiving? Wear your stretchiest pants. This isn’t the time to try and squeeze into those ultra skinny jeans. You’ll be miserable. Ask me how I know. 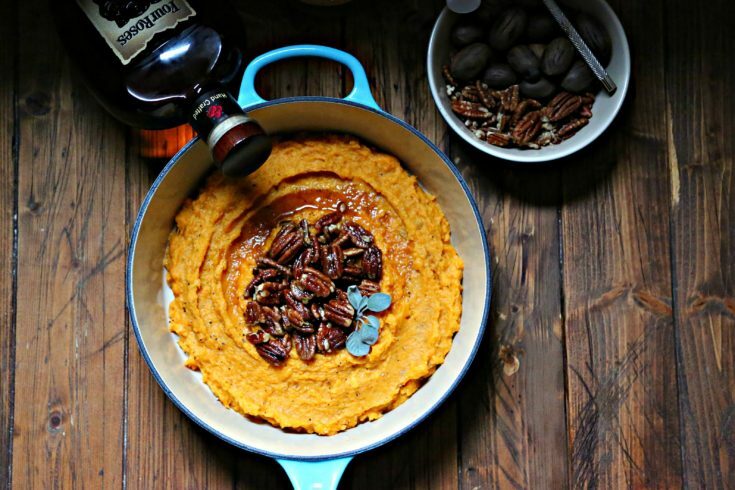 Boozy Smashed Sweet Potatoes topped with crunchy maple pecans is the perfect alternative to sweet potato casserole. Place sweet potatoes into a large pot and cover with cold water. Add salt and bring to a boil. Reduce heat and simmer the potatoes for approximately 25 minutes or until fork tender. Drain and return to pot. Add butter (minus 2 tablespoons) and bourbon while the potatoes are still hot. As you stir the potatoes, they will naturally mash. Add cream. Season with salt and pepper to taste. Mix to combine. Transfer sweet potato mixture to a serving dish. Set aside. Into a saute pan add remaining 2 tablespoons of butter and melt over medium heat. Add: pecans, maple syrup. Cook until just incorporated. 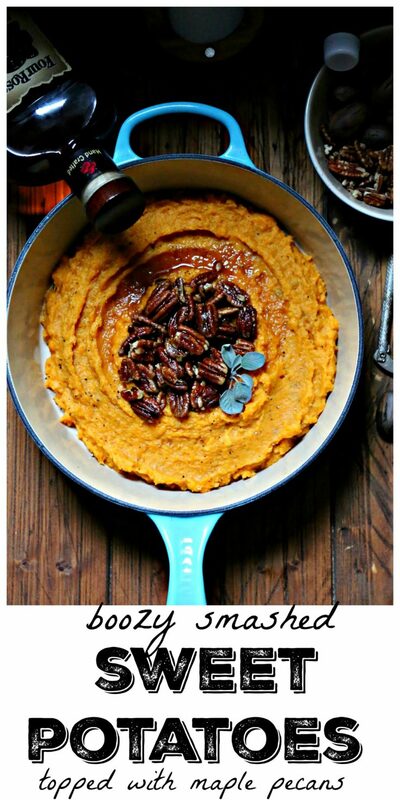 Spoon the pecan mixture over the sweet potatoes and serve. Garnish with fresh sage if desired. These sound like a super awesome side! Yum! This is such a great idea. I bet the flavors are perfect!! These look perfect to cook tomorrow! Can you come to my house for Thanksgiving? Yum! These look & sound wonderful, Paula! Drooling! Those look so wonderful! Happy Thanksgiving Paula! I never would have thought of sage with maple sweetness, but it does sound good. Oooo, I love boozy everything! Would it work to nuke the sweet potatoes till just tender, then peel and cube? Yum. 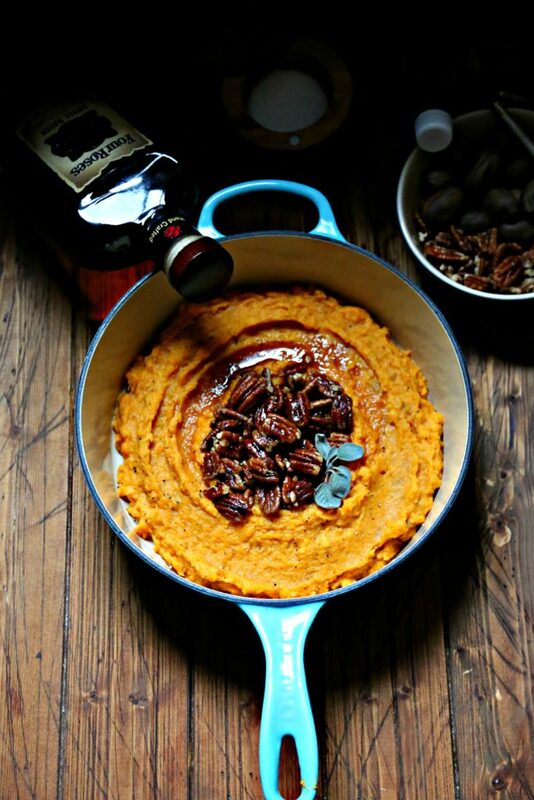 Boozy sweet potatoes? Why haven’t I been doing this? This is so intriguing. I want to try it!! really great! made all new recipes for our thanksgiving this year. this was one of them! soooo good! thank you for sharing the recipe! Amazing recipe. I tried a variation of this recently and it turned out wonderful!